The three of us standing at the altar are the most intimate, unexpected and meaningfully unique moments I’ve ever known. This gallery is dedicated to those special moments. 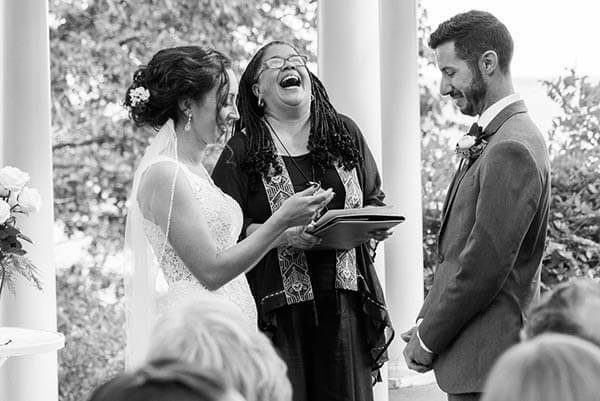 I believe I’m laughing at the bride’s vows. She’s reading something like “I promise to laugh at some of your dumb jokes but NOT ALL OF THEM. She said that last part really slowly and seriously. Hilarious. This is Kylee & Steve getting married at The Mooring in Georgetown, Maine. It’s a beautiful B&B/wedding venue. The owner’s son, a real Maine lobsterman & caterer, put on the elaborate lobster bake reception right on site. Fun fact: The owner’s father donated the land for Reid State Park. DJ/sound professional: Mike’s Music Mix. Photograph by Brendan Bullock Wedding Photography. Flower & Dress info forthcoming.